When responding to the more than 1.2 million blazes reported annually, the nation's firefighters usually start with a dangerous disadvantage: They often lack critical information—even something as basic as a floor plan—that could be vitally important in mounting the most effective and safest attack. A report by NIST and FPRF lays out a research plan for advanced cyberphysical systems that could greatly improve fire-protection and fire-fighting capabilities. That information gap could be erased with today's communication, computing, sensor and networking technologies according to a new Research Roadmap for Smart Fire Fighting. Prepared by the National Institute of Standards and Technology (NIST) and the Fire Protection Research Foundation(FPRF), the roadmap charts the path toward overcoming technical obstacles so that those interconnected technologies, known collectively as cyberphysical systems, or CPS, can be harnessed to greatly improve fire-protection and fire-fighting capabilities. "The ultimate aim of the roadmap is to enable real-time delivery of useful information before, during and after a fire incident or other emergency—to get actionable intelligence to the first responders who need it, when they need it," explains Anthony Hamins, the head of NIST's Fire Research Division. A CPS wirelessly connects information technologies and physical objects that incorporate computer chips or other devices that can capture, store and transmit data in ways that yield useful information to support timely decision-making. Examples of current CPS applications are early manifestations of the so-called "Internet of Things." They include "smart homes" with programmable thermostats, appliances that can be controlled with a cell phone, and systems that remotely diagnose and repair industrial machinery. Far more ambitious CPS endeavors, from "smart" buildings and "smart" highways to "smart" bridges and "smart" cities, are underway. "Among the many possible CPS applications, smart firefighting should rank among the most compelling," says Casey Grant, executive director of FPRF, the research affiliate of the National Fire Protection Association(NFPA). "It can help to protect and improve the safety and effectiveness of the nation's 1.1 million fire fighters and, as a result, greatly reduce the national fire problem." Smart fire fighting, the roadmap explains, can capitalize on growing collections of community and building-related data—from inspection reports to digital building information models—and the increasing adoption of computer-controlled building management systems. For example, units responding to a high-rise fire could access information on current traffic conditions to determine the fastest route to the scene. And while en route, fire fighters could go over building drawings and floor plans, scan surveillance cameras to locate occupants, check whether hazardous materials are on the site, and review other information vital to mounting an effective fire-and-rescue operation. Data captured and sent by mobile and stationary sensors—situated in buildings and attached to fire-fighter equipment and clothing—can significantly improve the situational awareness of incident commanders and responders. Sensors embedded in personal protection equipment, for example, can detect hazardous materials, monitor temperature and alert to the potential for flashover, and track the location and health condition of responders. And equipping employee badges with sensors could help rescuers to locate them in a burning building. The roadmap also details the potential benefits of deploying sensor-laden robots, drones, other unmanned vehicles and equipment at fire scenes. These technologies could be used both to provide situational awareness—a"360-degree view" of the scene—and to report useful data on conditions within a burning structure. Mobile sensors, according to the roadmap, may be especially valuable when battling wildland fires, which often require the assistance of firefighters dispatched from outside the affected area. Sensor-supplied data, combined with other digital information, could familiarize responders with the terrain, weather conditions and other factors that influence a fire's path and how fast it is spreading. Fire departments in several cities already are exploiting CPS technologies. When fire fighters are dispatched in Frisco, Texas, for example, they access a system that displays maps, locations of fire hydrants, lists of hazardous materials, site details and other information. The roadmap also cites New York City's FireCast, a "data-driven predictive risk-engine." Now in its third iteration, FireCast gathers data from numerous sources—from building permits to power outage reports—to develop daily-updated fire-risk profiles for each of the 330,000buildings in the city's inspection database. Fire inspectors use FireCast to prioritize inspections, leading to an increase in the number of reported violations, which is expected to pay off with a reduction in fire losses. Numerous opportunities to leverage CPS applications for preventing and fighting fires more effectively are described in the roadmap. While some will require advances in technology, many hinge on standardization, prototyping demonstrations, testing and other underpinning efforts. Major challenges include ensuring reliable connectivity and technology performance in hostile fire environments; achieving interoperability among disparate databases, devices, software tools, networks and organizations; and preventing information overload, which undermines the goal of timely, targeted decision-making. The roadmap suggests several vehicles to speed progress. 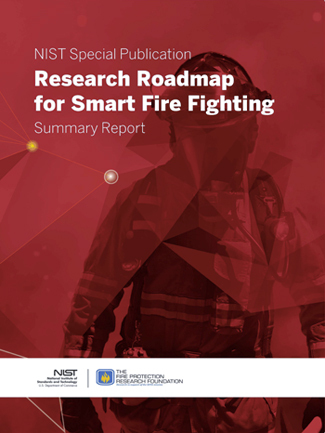 The Research Roadmap for Smart Fire Fighting draws on contributions from industry, university and government experts in data, communications, human factors, fire science and fire fighting. It can be downloaded from the NIST website www.nist.gov/manuscript-publication-search.cfm?pub_id=918636 or the NFPA website www.nfpa.org/~/media/files/research/research-foundation/current-projects/smart-ff/smartfirefightingreport.pdf.